Walking Through the Calculation of the Dividend Cushion Ratio - Valuentum Securities Inc. Shown: With brands such as Kleenex, Kimberly-Clark holds the No. 1 or No. 2 brand share in 80 countries; source: Kleenex. This article is for educational purposes only to explain the nuts-and-bolts behind the calculation of the Dividend Cushion ratio. To access our updated opinion on Kimberly-Clark, please view its 16-page report and dividend report on its stock landing page. A version of this article appeared on our website July 3, 2013. Updated July 10, 2017. Image shown below: Page 2 of Valuentum's dividend report on Kimberly-Clark, as of March 2017. We've received a significant amount of interest in the Dividend Cushion ratio, and we wanted to walk through the Dividend Cushion ratio calculation for an example company, Kimberly Clark (KMB), in this article. The Dividend Cushion ratio is derived from the forecasts within our discounted cash-flow models, and the ratio measures the financial capacity of a company to pay and grow its dividend, not the willingness of the company to pay and grow its dividend. Both capacity and willingness are necessary to achieve sustainable growth in a company's payout, in our view. Kimberly-Clark is generally what is described as a Dividend Aristocrat, meaning it has raised its dividend in each of the past 25+ years (40+ years in Kimberly Clark's case). The firm's dividend yield is above the ~2% average for S&P 500 companies, offering a ~3% annual payout at recent price levels. We generally prefer annual dividend yields above 3% and generally don't include firms with yields below 2% in the Dividend Growth Newsletter portfolio, which we update monthly as a key component of the Dividend Growth Newsletter, released on the first of each month to members via email. We measure the safety of a company's dividend in a unique but very straightforward fashion. As many know, accounting earnings (EPS) can fluctuate significantly through the course of the economic cycle, so using the dividend payout ratio (dividends per share divided by earnings per share) in any given year has limitations. Plus, companies can often encounter unforeseen charges, which makes accounting (reported) earnings a less-than-predictable measure of the safety of the dividend. For example, we know companies won't always cut the dividend just because earnings have declined or in cases, for example, where a firm had a restructuring charge that put it in the red for a quarter (or year or two). We therefore believe that assessing the forward-looking free-cash-flow and balance-sheet dynamics of a business, in conjunction with the firm's dividend payout ratio and other items, is a more reasonable approach in determining whether a firm has the capacity to continue paying and growing dividends than the dividend payout ratio alone. This line of thinking has led us to develop the forward-looking Valuentum Dividend Cushion ratio. The Dividend Cushion measure is a ratio that sums the existing net cash (total cash less total debt) a company has on hand (on its balance sheet) plus its expected future free cash flows (cash from operations less all capital expenditures) over the next five years and divides that sum by future expected cash dividends (including expected growth in them, where applicable) over the same time period. Basically, if the ratio is significantly above 1, the company has financial capacity to pay out its expected future dividends, by our estimates. The higher the ratio, the better, all else equal. An elevated ratio doesn't ensure the company will keep paying dividends, however, as management's willingness to do so is another key consideration, but the ratio acts as a logical, cash-flow based ranking of dividend health, much like a corporate credit rating, for example, ranks a company's ability to pay back debt (default risk). Income investors generally would like to see a Dividend Cushion ratio much larger than 1 for a couple of reasons: 1) the higher the ratio, the more "cushion" the company has against unexpected earnings and cash shortfalls, and 2) the higher the ratio, the greater capacity a dividend-payer has in boosting the dividend in the future. At the time of the publishing of this article, for Kimberly-Clark, the ratio is 1.2, revealing that on its current path the firm should be able to cover its future dividends (and the expected growth in them) with net cash on hand and future free cash flow over the measurement period. To arrive at the Dividend Cushion ratio for Kimberly-Clark, we divide the numerator ($9,056 million) by the denominator ($7,485 million) in the image below. The numerator represents the sum of a firm's net cash position and its cumulative analyst-driven 5-year expected free cash flows, as measured by cash flow from operations less all capital spending. The denominator represents the sum of a firm's cumulative 5-year expected cash dividends paid. A ratio of 1.2, as it is for Kimberly-Clark, can be considered GOOD, absent any extraordinary considerations. In most cases, the higher the Dividend Cushion ratio above 1, the better. As shown in the image below, we estimate the sum of Kimberly-Clark's net balance sheet position at the end of last fiscal year and its future expected free cash flow to be generated over the next five years is ~$9.1 billion. We also estimate that the company will pay out ~$7.5 billion in cash as dividends over the same time period (this forecast includes dividend-per-share growth). In a simple construct, we divide the numerator by the denominator to arrive at a Dividend Cushion ratio of 1.2 for Kimberly-Clark. The difference between the numerator and denominator of the Dividend Cushion ratio is the firm's 'total cumulative 5-year forecasted distributable excess cash after dividends paid, ex buybacks.' The difference represents the excess cash that can be applied to more dividend increases (above that which are forecast in the analysis) during the 5-year measurement period. The following build in the image below is a mapping of Kimberly-Clark's residual free cash flow after deducting both capital spending and cash dividends (and after considering net debt obligations). The build up below illustrates why Kimberly-Clark has a Dividend Cushion above 1. The residual blue bar at the right of the chart, or the difference between the numerator and the denominator in the above graph, is positive, even if it may be modest in the context of the firm's robust cash-flow-from-operating dynamics. All else equal, when it comes to dividend growth, we tend to like equities that have large Dividend Cushion ratios, though management's willingness to sustain and raise the dividend, business model risk and valuation can and should never be ignored. It's worth noting that companies that have high Dividend Cushion ratios may have a significantly larger 'blue bar' than Kimberly-Clark's, relatively speaking and in the context of their respective financial statements. We posit that such companies have significantly more excess cash that can be applied to future dividend increases, all else equal. The chart immediately above shows that Kimberly-Clark has a significant amount of dividend obligations to pay out in the coming years relative to its future expected free-cash-flow generation over this time frame (the dividends paid is the fourth bar from the left and absorbs cash generated from operations, the first bar on the left). The above analysis at the time of publishing considers ~4% annual future growth rate dividends per share, as shown on the front page of the firm's dividend report (see image at bottom of article)--meaning the analysis is forward-looking and considers growth expectations in the dividend, too. This is an important consideration--the Dividend Cushion ratio measures the Safety and Dividend Growth Potential of the dividend payout above and beyond our expected dividend growth rates. Within the Dividend Growth Newsletter portfolio, we generally prefer firms that have a very large estimated residual cash position over the next five years, or a very large measure of 'total cumulative 5-year forecasted distributable excess cash after dividends paid, ex buybacks' -- the blue bar in the graph immediately above. The companies with the largest 'blue bars' are the ones with the strongest future dividend-growth prospects as measured by financial capacity, in our view. Investors may consider equities that have a good balance of a strong dividend yield that meets certain personal criteria, a strong Dividend Cushion ratio to capture both required income and dividend growth dynamics, and is headed by a management team dedicated to sustaining and growing the payout. Such firms have nice income streams, but they also may be ones poised for material expansion. Now on to a discussion of the potential growth of Kimberly-Clark's dividend. As mentioned above, the greater the "cushion," the greater financial capacity a firm has to raise the dividend, in our view--but such dividend growth analysis is lacking if management's willingness to increase the dividend is ignored. As such, we evaluate the company's historical dividend track record. If a) there have been no dividend cuts during the past 10 years, b) the company has had a nice growth rate in recent years, and c) the firm boasts a strong Dividend Cushion ratio, we'd rate its future Potential Dividend Growth as EXCELLENT, which is the case for Kimberly-Clark. After all, in this case, Kimberly-Clark is a Dividend Aristocrat--meaning it has raised its dividend in at least each of the past 25 years. The dividend is important, but it is not everything. Capital preservation is also an important consideration for income investors, or for all investors, for that matter. We therefore assess the risk associated with the potential for capital loss. The in-depth valuation analysis is primarily included in each firm's 16-page report (a separate report than the Dividend Report), but we also provide the valuation conclusions in a firm's Dividend Report for convenience. In Kimberly-Clark's case, at the time of the publishing of this article, we think the shares are FAIRLY VALUED (the firm's share price falls within our estimated fair value estimate range), so the risk of capital loss is rated as MEDIUM. 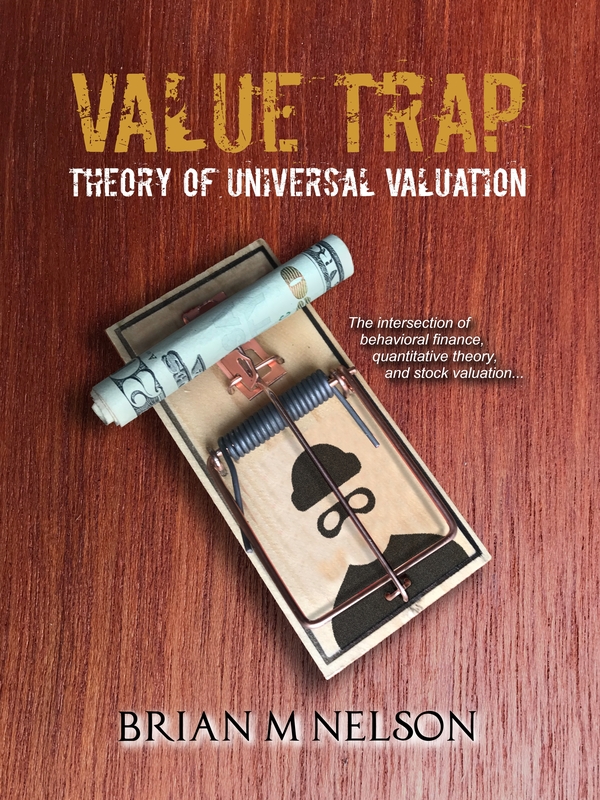 If we thought shares were undervalued, the risk of capital loss would be rated as LOW. 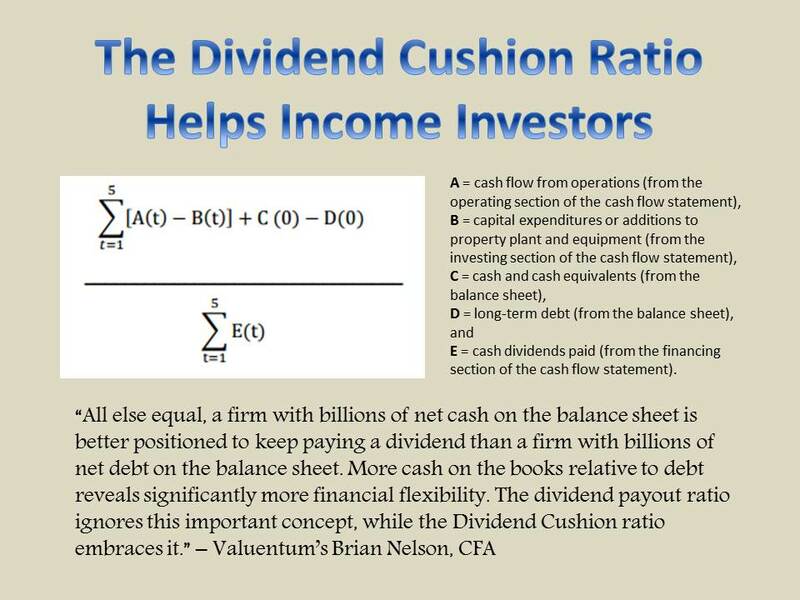 The Dividend Cushion ratio is a forward-looking ratio (with a numerator and a denominator). It tells readers, on the basis of our estimates, how many times future free cash flow (cash from operations less capital spending) will cover future cash dividend payments after considering the net cash on the balance sheet, also a key source of dividend strength. It is purely fundamentally-based and driven from items taken directly from the financial statements. We think the Dividend Cushion ratio should be assessed at least quarterly, as it reflects an ongoing assessment of the health and safety of a company's dividend payout. Firms with high dividend yields, strong Dividend Cushion ratios, and a committed management team are ones with relatively large income streams that are poised for continued expansion, in our view. << FAQ: Where Can I Find the Valuentum Dividend Cushion Score? Image shown below: Page 1 of Valuentum's dividend report on Kimberly-Clark, as of March 2017.